Salads are often frowned upon by the nutritionally unacquainted, and if you’re one of them; you are missing on a lot. Salads have evolved to more than just lettuce and fat-free dressing. It comes in a variety of unique flavors, colors, textures and different ingredients that can surely satisfy your cravings—no matter what type of eater you are. Adding to its flexibility, a salad can be served warm or cold; you can even cater it as a side dish or part of the main course. The keystone of a good salad is variety. It should stimulate your palate and excite your eyes, with all its fresh and delicious ingredients—lustily mixed and matched to create a glorious meal. A salad dish is bursting with vitamins and minerals, protein, filling fiber and other nutritious benefits. You can transform your lunch, and just about any meal into a healthy and satisfying feast. 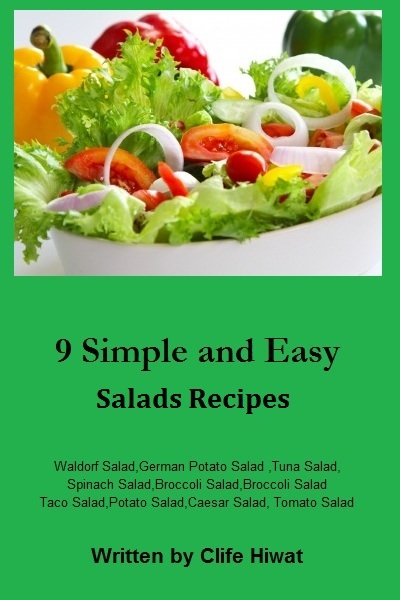 This book offers you a selection of classic salad recipes, with easy to follow procedures, and preparation time guide to help you choose a particular recipe for different occasions. If you are often put-off by lavish ingredients and complex preparations used in typical salad cookbooks, this book will not only arouse you taste buds, but entice your senses, with easy to find ingredients and procedures that are made simpler for unmotivated eaters. Start now, and enjoy mixing and matching.